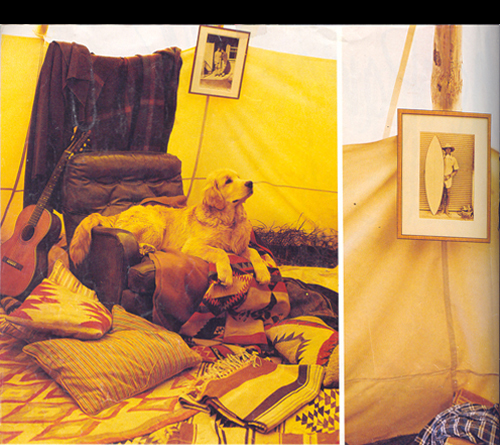 Hightail it to Little Bear, where photography megastar Bruce Weber and cohort Nan Bush tuck up their guests in tepees. 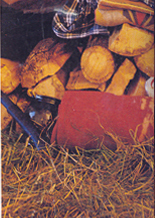 With their Edward S. Curtis sensibility, Bruce Weber's tepee photos could fit seamlessly into one of Curtis' 20 volumes on The North American Indian, Weber named the ranch on which the tepees stand Little Bear after one of his four golden retrievers (the other three: Rowdy, Blue, and Palomino). "I think of that first moment driving over the top of the hill when I see the tepees - see their whiteness." Bruce Weber experiences this epiphany every summer when he has half a dozen tepees set up at Little Bear, his ranch in Southern Montana's Absaroka Range, to provide shelter for summer guests. Weber and his long-time companion, Nan Bush, realized they wanted to get closer to the land the year after they brought a couple of old schoolhouses in the Crazy Mountain's foothills to fix up for summer getaways. Suddenly here was another irresistible set of real estate agent's photos delineating the perfect wilderness building site. I said, "Nan, the last thing we need is a place to build another house." But it turned out to be sort of a child's version of Yellowstone National Park; no geyser, but 12 lakes and ponds. When we drove up to see it, the first thing that happened was a mountain lion crossed our path. It was like destiny taking over, you know, buy this place, don't allow hunting.